I have a fractured vertebrae in my back, making it difficult to hold my K3 with a long (heavy) lens for photos. I just got the Vanguard AM-364 from B&H. I put my Sirui K20X ballhead on it. I have a very compact camping chair that I sit on outside for bird photos. 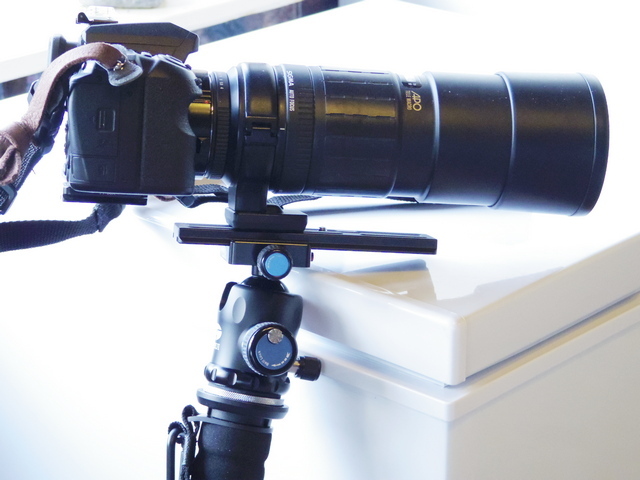 What a delight this monopod setup is! I've lost many photos without it, as the birds would see my movement of raising the camera to take a photo, & be gone! Now, I can sit for very long periods of time, and am getting more photos, without much movement. I highly recommend this setup for anyone that hasn't tried it! 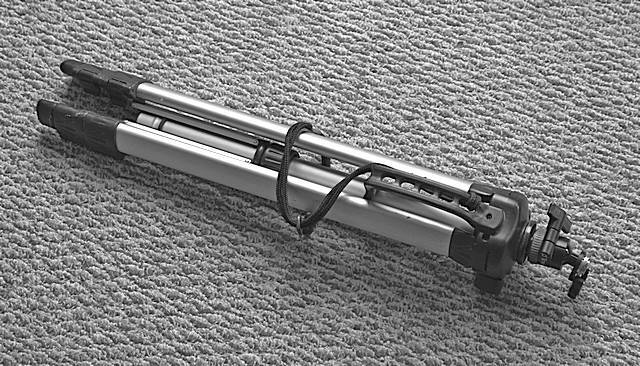 Only "problem" with the Vanguard monopod; a B&H staff member answered a question on the monopod page, saying it did indeed have an "adaptor" bottom. 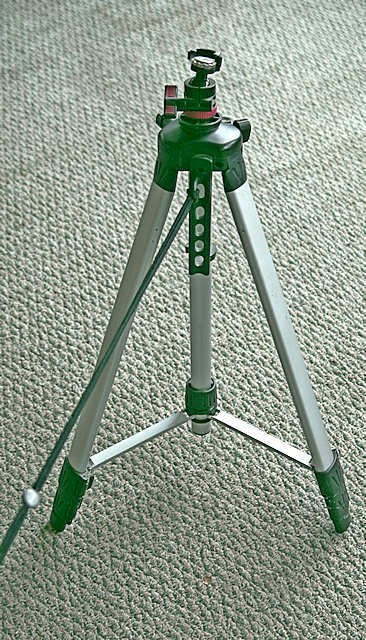 I also just received the table tripod (Manbilly) that I had wanted to use with the monopod. The monopod bottom, when the rubber tip is removed, is simply hollow; no way to attach anything. Other than this false information, I really love the Vanguard. It has a nice cushioned area to hold/carry with. It has the "flip" extensions, rather than the twist, which I like much better. It has a nice strap that easily adjusts to your hand size. Also has a clip to carry on a belt, if desired. Hi Carol, very sorry to hear about your back problem, hoping for a very speedy recovery for you madam. 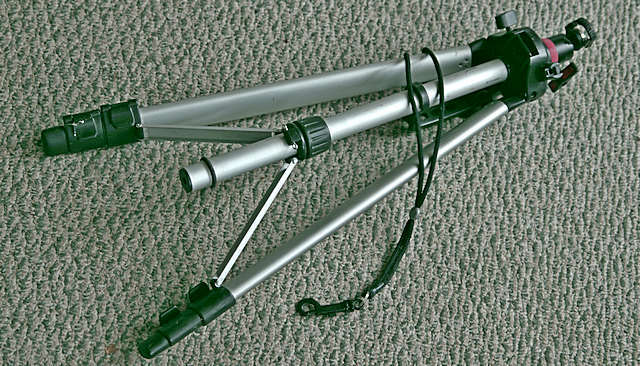 Now, about your monopod, I am assuming that you want to use the " mini tripod " as feet for your monopod? Manfrotto make a foot that might be what you need. Hope this helps, or at least gives you some ideas. Good luck with the monopod issue, and VERY good luck with your back. Looks nice. Can you recommend ball head which suites it? Peter, thank you. Sadly my back problem is ongoing; a fractured vertebrae that has collapsed on the one below it. I really don't like a foot that is on a ball. Had one, and could never get it tight enough to hold my camera. I'm frankly enjoying the monopod without the feet. It's very easy to handle; I didn't think I would like one, without a base. The ballhead is super; holds the K3 with the 300 F4, plus TC without a problem! The tripod I use is a Vanguard Alta Pro 264AB 100. 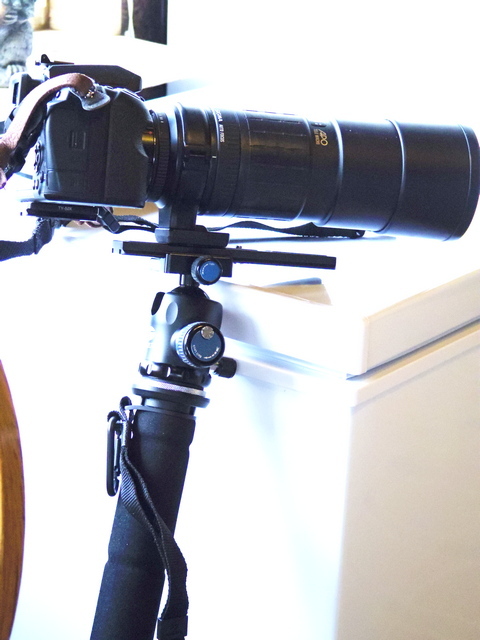 The SBH 100 ball head from the Vanguard tripod fits on the Monopodand works exceptionally well. Being able to use the one ball head on both was a deciding factor for me. Any of the Vanguard ball heads will work. If you are using heavy lenses, my combo works extremely well. The monopod Vanguard AM-364 is rated to hold 26#. The Sirui K-20X Ball Head's rating is 55#!! The ball head is a delight to use. When adjusted, it holds the weight of that 300 F4 lens, even when tilted down! I couldn't be happier with this outfit! Monopods are great with long lenses, they really help capture steady images when I haven't got time to set up a tripod or haven't got it with me. I'm very impressed with the ease of using one. I can sit for hours now, and the weight of the camera is not on my neck or back, and I can have it focused on a certain spot & be ready to take photos with very little movement that would frighten the wildlife! With a quick-release bracket on my Sirui ball head, I can remove the camera instantly, if needed. All in all, really loving how much easier it's making my photography! My mono-pods have two feet - and are much more usable with the extra foot. I've always thought using a mono-pod was like balancing a beach ball on a stick and loosing control can be VERY expensive. And tripods are way too much trouble in the field except in the most deliberate circumstances. A bi-pod is my perfect compromise. Economical: It doesn't have to be an expensive item because it's not intended to be a rock-solid tripod. Mine are light, aluminum types picked up used for $5 - 10. Stable: You can't turn a mono-pod loose! Unlike a mono-pod, having two feet it provides full lateral support. With the lanyard clipped to your shirt/belt or any nearby support to provide a third foot it's a hands-free camera support. Wanna change lenses? Just make sure the two feet are well placed, but even if something slips the lanyard keeps the camera from hitting the ground. Versatile: Close the two legs and it becomes a mono-pod. Typically that avoids the intent of the "No tripods Allowed" rule and is much more maneuverable in a crowd. Adding a second leg also greatly aids in balancing the heavy lenses without adjustable add-ons. Compact: Significantly lighter, smaller and more 'pack-able' than an equivalent tripod with as much useful stability in the field. Another of my lighter bi-pods has adjustable width chains and clips in place of the solid leg links and pointed 'shoes' for more stability on open and uneven ground. The convenience and versatility of bi-pods offers a significant advantage over either tripod or mono-pods in many situations. Last edited by pacerr; 03-18-2018 at 11:02 AM. You can't turn a mono-pod loose! I never would! I always have the camera strap around my neck at all times when on the mono-pod. I like that I can move it around 360 degrees, tilting in whatever direction I want. Changing lenses, I simply put the monopod between my knees, strap still around neck, and change lenses. I also have at times, leaned the mono-pod "backwards" over my leg, with the lower part under my other leg, and that gives me good support while changing lenses. Never have tried the 2-foot monopod, so can't comment on that. are you or do you know anyone who is " handy "
Last edited by aslyfox; 03-20-2018 at 10:23 AM. I'm very happy with my monopod just the way it is. Allen, that's a good idea; adapt the bottom of the mono-pod to accept the thread of a mini- or table-top pod to add 'feet'. Collapsed, the mini-pod "feet' would still function as a mono-pod but is removable as desired. There are many types of threaded inserts that would accommodate either a solid wood plug or a tight fitting plastic plumbing cap.